What are the best 3 wheel recumbent bikes? Recumbent bikes have grown a lot in popularity over recent years, and for good reason. They are an excellent way to keep fit and above all get out and enjoy the outdoors and the thrill of cycling. In this article, we look specifically at the best 3 wheel recumbent bike, often referred to as a trike. A trike, or if we are to use the correct term, a tricycle, is a human-powered single person passenger vehicle (or a bike with 3 wheels to you and me!). They can be powered by either foot pedals or hand cranks, there are also motorized variations that take advantage of either electricity or an engine like you have in a small scooter for example. You will have seen the traditional upright recumbent trikes on TV or perhaps on your travels if you have visited any Middle Eastern countries, as they are often used as taxis to transport tourists. The 3 wheel recumbent bike has the distinct difference of a reclining seated position, which offers many benefits as we will see below. Having a lower level of gravity and a triangular like design, with the main steering wheels at the front supported by 2 rear wheels, you get the benefit of cutting through the wind. This results in less drag and as a result, it is less taxing on the arms or legs, depending on the model you have. On a standard upright bicycle or trike, your entire body weight rests on just a few small sitting bones, the hands and the feet. With a recumbent bike, however, the reclined seating position makes use of the riders bottom, back, legs and feet – spreading the weight. Unlike a standard upright bike, when encountering a hill, the rider of a recumbent cannot stand up out of the saddle in order to generate more force. Therefore, they must select a low gear and use the backrest of the bike to do so. This is sometimes seen as a negative by some, however, if exercise and fitness are important to you, and it should be, then we see if as a benefit! The speed record for a human-powered vehicle is owned to a Dutchman on a recumbent bike. Granted this was on a 2-wheeled model, however, it goes to show just how effective the low profile is. Having the body positioned so low on the ground really makes a huge difference in windy conditions. Because recumbent trikes are so low to the ground, often road vehicles have trouble seeing them, which can be potentially dangerous. So the majority of people who enjoy this sport on three wheels opt for a recumbent trike flag. This can be anything you would like in terms of design, however, its main purpose is to allow you to be seen and to keep you safe. Many of the flags have a small flashing light on top of the pole, this helps you to be seen in low light levels. With some of the higher end models with 8+ gearing options, it is best to wear proper cycling shoes that can clip into the pedals. This not only offers you support and safety from the fast spinning pedals but also greater power and speed as you get the push AND the pull force from your legs when cycling. The Mobo models are designed for leisure more than serious competition style cycling. 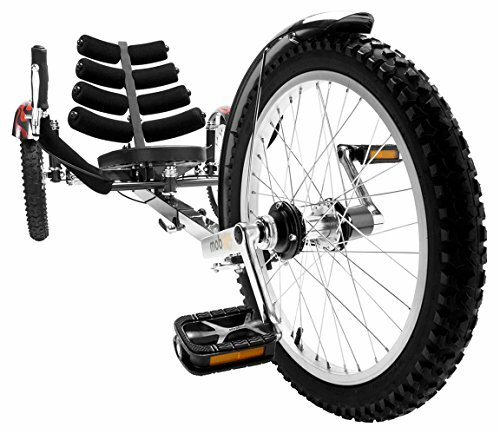 They offer a comfortable ride and reduced pressure on the body due to their seat positions. 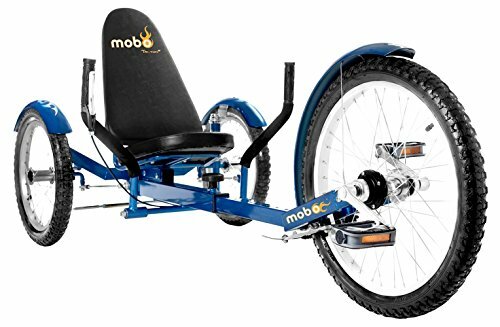 The price range on the Mobo models offers the ability for even the novice recumbent cyclist to get involved in the sport. Users have noted the ease of assembly on this model and the ability to adjust the frame to suit the individual height of the rider. It is best suited to flat terrain, so if you are planning on tackling big hills, then you may struggle. Some have quoted to top speed being limited to 3-4mph due to the gear ratio. For a leisure cruiser that's great for walking the dog and gentle exercise then this is great. This model s not suited to the more serious rider who wants to get a serious workout from their recumbent bike. Another model from Mobo, this time, the ‘Shift Reversible”. This bike was the first of it's kind to introduce a reverse gear, which as recumbents are known for their larger than average turning circle, offers a great way to maneuver the bike without too much hassle or hard work. Customers found that this trike offered great comfort when riding due to the padded seating and backrest and also the adjustable nature of the seat. It also offers a decent workout, better than the Mobo Triton reviewed above. The one area it seems to be lacking is in the quality of the tires which may need replacing after a few months, depending on your usage and terrain of course. Much like the Mobo Triton, this ‘Shift' is designed with the leisure rider in mind, so that makes it suitable for kids from age 9 to adults and seniors alike. It's also great if you suffer from a bad back and cannot ride a standard upright. Whilst not designed for serious hills, the shift recumbent does being a lot to the table in terms of design, price, and features. The Terra Trike is unique amongst the trikes reviewed in this article in that is has been designed for the masses. Meaning mean, women and children can use this bike for everyday uses, such as going to the store, walking the dog and even commuting to and from work. One user commented on how they bought this recumbent on a recommendation after having knee surgery and it has enabled them to shed the weight and get back into shape. One comment that was made was on the size of the crank, by requesting a larger one it will increase the speed at which you are able to travel at. This may be important for you, so it's important to point out. However, this can easily be done and a local bike shop of even on your own if you have the tools. If you're looking to lose weight or just get fit and healthy, the Terra is a great choice, even for the young and the older amongst us. It is built for road and pavement cycling but also has the ability to go off-road on dirt tracks etc. Now we start to get towards the premium end of the market, with the Mobo Triton. 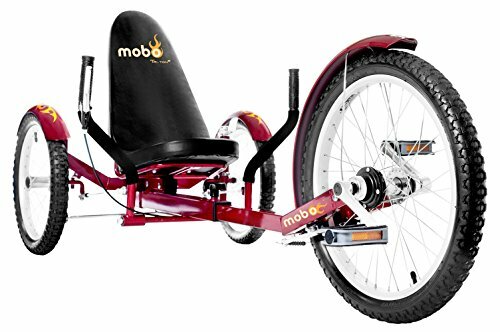 Mobo is known for their build quality and designing trikes that are fun to ride and provide a great workout. What's unique about mobo the models is their ability to go off-road and they are also suitable for ages 18 and over. One recent user commented on losing over 60 lbs as a direct result of riding this trike. He is also 6'4″ so that shows just how suitable this trike is to all riders. One of the only negatives I have seen mentioned is that it's tough going up hills on this trike. However that's is also a big part of the fun, as you then get to go downhill, super fast! 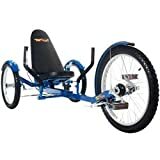 A great recumbent bike designed for serious riders with previous experience and those looking for something a little faster and lighter than the cheaper cruiser models. The Performer X 27S comes with lots of extra bells and whistles that make your ride that much better. From a unique seat design to a Shimano gear set, it takes the best of an upright bike and puts them into this fun trike. One of the main points raised with this higher end trike is that proper clip-in cycling shoes are a must due to the speeds that can be generated from this machine. The build is supposed to be fine for just one person to tackle, however, some of the instructions can be a bit of a head scratcher so 2 people would be better. This is a highly rated recumbent bike with a lot of added extras you don't get from the lower end, cheaper models. The rear suspension and Shimano gear set just tells you what has gone into this bike and just what it is capable of. If you are planning to do some good miles on your trike, then the Performer Trike-X 27 will do the job and then some. if you are looking for a great priced trike that has the ability to be upgraded at home whenever you choose then the Typhoon is a great option. The money you save on this model can be used on additional gear, a safety flag and even upgraded tires and gear sets further down the line should you wish. The best 3 wheel recumbent bike at a great price is more than you can ask for.